The main goal of safety and health programs is to prevent workplace injuries, illnesses, and deaths, as well as the suffering and financial hardship these events can cause for workers, their families, and employers. 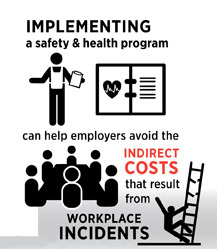 The recommended practices use a proactive approach to managing workplace safety and health. Traditional approaches are often reactive – that is, problems are addressed only after a worker is injured or becomes sick, a new standard or regulation is published, or an outside inspection finds a problem that must be fixed. These recommended practices recognize that finding and fixing hazards before they cause injury or illness is a far more effective approach.